If you’re a junior racer looking for a high-performance inflatable SUP that’ll help you mix it in race conditions, we recommend the 10’6” Max Race, which is built for speed and close competition. Now available in two widths 24″ and 26″ to suit a wider range of paddlers. If you’re getting serious about the 12’6” racing class, you’ll need a super-fast board that’s been developed to compete against the best – and win. That board is the Red Paddle Co 12’6” Elite inflatable SUP, the fastest board in its class. The secret behind its speed is in the details. 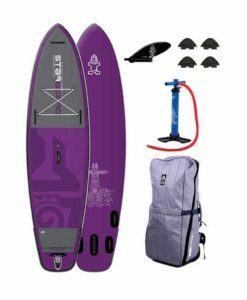 It utilises our patented RSS system, which stiffens the board so there’s no flex, a common flaw in inflatable race boards, and our patented Forward Flex Control system which stiffens the front section of the board using a carbon compression strut to remove flex that can be created in a race and channels this towards the back of the board increasing overall board speed. The two combined work together to create the fastest inflatable SUP’s currently available on the market. The board also features double nose fins to aid tracking and displacing water from the deck of the board. The glass fibre centre fin supplied as standard gives the right amount of grip without adding drag, whilst the angled design prevents any debris from getting stuck on the fin. Multiple carry handles are included to provide fast entry and exit of the water and have been designed not to get in the way during racing. The diamond cut, Red embossed deck pad provides ultimate grip in control in all stages of a race. The 12’6″ Elite Race comes fitted with a special fixing that is compatible with Railblaza and Ram Mounts products, enabling you to securely attach a GPS to keep track of your speed during training and racing. Race 10'6" X 24", Race 10'6" X 26"